One size fits most. Easy to put on! Side Tie straps may be worn on the inside or outside of Apron. Shields ESD Sensitive Components and Devices from Technician induced static charges. The ElectraWear esd apron helps shield ESD (static sensitive) devices, components and product from the static laden Technician! One size fits most! 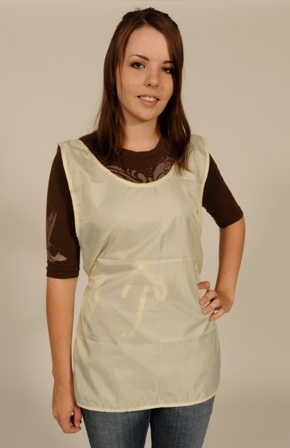 These unique static control aprons are manufactured from a premium light weight yet extra robust synthetic material that is nearly indestructible! The ElectraWear apron is cool, comfortable and perfect for a multitude of environments and is made from our premium ElectraWear Fabric. Provide a consistent look for your Technicians! Performance: ElectraWear ESD Control aprons are designed to shield static sensitive product from user induced static potential. These aprons are ANSI/ESD S20.20-2007 TR-53 test friendly and are compliant to ANSI/ESD S20.20-2007 STM2.1, "static control garment." Availability: Yellow and Sky Blue colors are standard but optional colors are available (minimums may apply). Sky Blue and Yellow are generally in stock and ready to ship. Alternate (non stock) colors are deliverable in approximately 8 weeks. Blue and Yellow in stock - multiple colors available. TR-53 test friendly and compliant to STM2.1 "static control garment." Cleaning Instructions: Machine Wash smocks on gentle cycle, warm water (at temps of under 104 deg F). Use proper amount of a liquid mild non-ionic/anionic detergent (like Tide 2x or similar) that contains no fabric softeners. Do not bleach. Wash smocks separately, do not mix with other industrial laundry. Dry on low setting (do not dry at temperatures over 110 deg F), do not tunnel dry. These smocks will dry very quickly, do not over dry. Hand washing: These smocks may be hand washed with the same basic instructions as above.